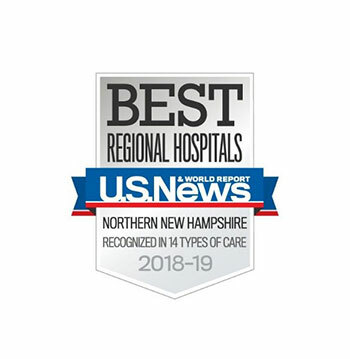 Dartmouth-Hitchcock Medical Center (DHMC) has been once again ranked as New Hampshire’s Best Hospital for 2018-19 by U.S. News & World Report. DHMC was also nationally ranked in the top 50 in gynecology, and was recognized as “high performing” in 14 clinical specialties and procedures: abdominal aortic aneurysm repair, aortic valve surgery, cancer, colon cancer surgery, diabetes and endocrinology, gastroenterology and gastrointestinal surgery, geriatrics, heart bypass surgery, heart failure, hip replacement, lung cancer surgery, nephrology, orthopaedics, and urology. Additionally Dartmouth-Hitchcock Medical Center was awarded the Best Regional Hospital Honor Roll badge for Northern New Hampshire. Dartmouth-Hitchcock is affiliated with Geisel School of Medicine at Dartmouth, and serves as the principal clinical teaching location. Geisel is one of only 149 accredited medical schools in the United States, and is ranked as the 27th best medical school for primary care by U.S. News & World Report. In addition to its partnership with Geisel, Dartmouth-Hitchcock trains nearly 400 residents and fellows annually and operates 49 accredited residency and fellowship graduate medical education training programs. Dartmouth-Hitchcock provides comprehensive gynecology services in five locations: Bedford, Concord, Keene, Nashua and at its flagship, Dartmouth-Hitchcock Medical Center in Lebanon. The full list of U.S. News & World Report rankings is published at health.usnews.com/besthospitals.